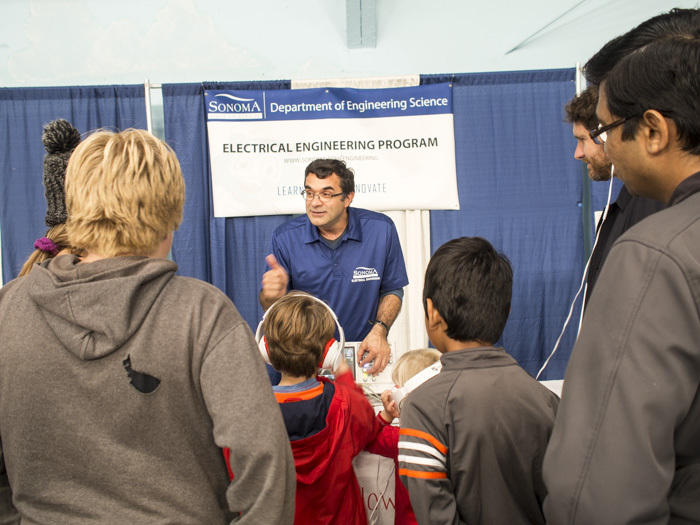 Engineering students at Sonoma State University showed off some of the cooler parts of science to a younger generation at the North Bay Science Discovery Day on October 29 at the Sonoma County Fairgrounds. "This was a great opportunity for our students to reach out and interact with young kids interested in STEM," says Engineering Science Professor Sara Kassis, faculty advisor to the Society of Women Engineers club at Sonoma State. Thousands of young students participated in activities with SSU professors and students at the event, including building Android apps for smartphones, "hacking" a Roomba with a laptop, testing their hearing while seeing sound waves on an oscilloscope and building simple electrical circuits. "It was great seeing the kids so interested and engaged in building simple circuits and connecting lights, batteries and motors together," says Engineering Science Lecturer Shahram Marivani. The North Bay Science Discovery Day is designed to stimulate the excitement of learning Science, Technology, Engineering, and Math (STEM) in North Bay youth during their most formative years. The event featured nearly 100 different educators, nonprofits and STEM-related companies as part of the annual Bay Area Science Festival. Sonoma State had three groups at the event: the Engineering Science Program was building mobile aps and hacking robots; the Nursing Club showed what germs look like under a microscope; and the School of Science and Technology walked students through a watershed from a variety of different perspectives. "The need for engineering education in the North Bay area is growing, and many local high-tech companies are recognizing a shortage of engineers and other high-technology employees in the area," says Engineering Science Department Chair Farid Farahmand. "We are trying to highlight the importance of technology and engineering education in STEM and attract more students to the engineering fields." Electrical Engineering students Abe Palmerin, David Story, Leeana Vargas and Cristin Faria presented hands-on activities for kids of all ages at the event. North Bay Science Discovery Day reports that more than 80 percent of kids who attended the event were able to participate in a hands-on activity with a scientist.